Data from 5 different countries (Figure 3) demonstrates that there is a strong correlation between overweight children and low levels of general cycle use. This evidence strongly suggests that as levels of cycling go up, levels of obesity go down (6). 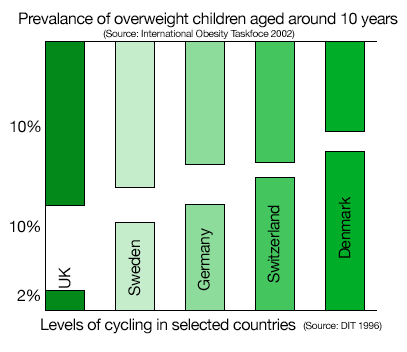 Despite the evidence that cycling can help prevent childhood obesity, rates of cycling use in children are plummeting. In 2003, less than 15% of students between the ages of five and 15 walk or bike to school, compared to 48% in 1969 (24). The World Health Organization estimates that physical inactivity is estimated to cause 2 million deaths worldwide annually (25). And they specifically mention cycling to and from work as an important element in addressing this global crisis. The improvements in cardiovascular health with bicycle commuting are so substantial that some countries health insurers actively support bicycle commuting (26). The health benefits of cycling are calculated to outweigh the risks by 20:1 (21, 26, 27).